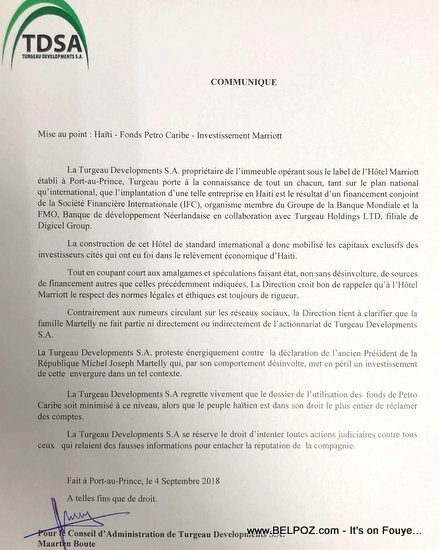 Here is a copy of the letter from Turgeau Developments S.A, owner of the building operating under the label of the Marriott hotel, reacting to the "casual" statements of the former President Michel Martelly who declared that the Marriott hotel benefited from Petrocaribe funds. The establishment of such an enterprise in Haiti is the result of joint financing from the International Finance Corporation (IFC), an affiliate of the World Bank Group and the The Netherlands Development Finance Company (FMO), or Dutch Development Bank, in collaboration with Turgeau Holding LTD, a subsidiary of Digicel group, the letter said. LTD, the note says, regrets deeply that the record of the use of Petrocaribe funds is downplayed at this level, while the Haitian people are in their fullest right to demand accountability. The Martelly family is neither directly nor indirectly part of the shareholding of Turgeau Developments S.A., the note said.